Shoulder Separation is an injury to the joint at the top of the shoulder where the acromion meets the clavicle, called the acromioclavicular (or AC) joint. The ligaments that hold these bones together are partially or completely torn, allowing the bones to separate. Do I need a Shoulder Separation Surgeon? 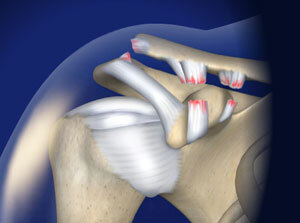 Shoulder Separation injury is easy to identify when it causes deformity. When there is less deformity, the location of pain and x-rays help the doctor make the diagnosis. Sometimes having the patient hold a weight in the hand can increase the deformity, which makes the injury more obvious on x-rays. Contact Omaha shoulder separation surgeon Darren Keiser for a consultation.